The Bankers Association of Zimbabwe (BAZ) has announced that banks in Zimbabwe are ready to exchange old, worn US dollar bills for new, fresh ones. This has brought much relief to Zimbabweans, not only because most of the smaller denomination notes are so dirty and soiled that you feel you need a tetanus shot after handling them, but because many street vendors, taxi drivers and shops have started refusing the disintegrating notes, claiming that their suppliers, in turn, wouldn’t accept them. Yet the same people who are refusing the old notes are giving people change in notes just as old and worn as the ones that they were refusing… so clearly they are accepting them from someone. Needless to say, this was really beginning to piss people off. BAZ president, John Mushayavanhu, said that this exchange measure is necessary to repatriate notes back to the United States, so that Zimbabwe can receive new bills from the Federal Reserve Bank of the United States. If Zimbabweans banked their money, it wouldn’t be necessary to make a call for people to exchange their notes, but since Zimbabweans don’t believe in the formal banking sector any more, opting rather for the safekeeping under the mattress method, it’s become necessary. You see, avoiding banks means avoiding banking charges, which are exorbitant in Zimbabwe, so you can’t really blame anyone. Mashayavanhu added quickly that, “the notes can be exchanged free of charge”, knowing full well that Zimbabweans would never exchange them if they had to pay a fee for such exchange. It’s actually not so random to have to tell Zimbabweans that they won’t have to pay for money… there was a time when cash was so short that you had to buy it, at a profit to those lucky few who had access to the cash reserves. You gave them a cheque for, say $100 000 and they gave you $80 000 in cash. What craziness. This soiled notes situation made me reflect on the journey that Zimbabwe has taken over the last 10 years or so in regard to money. Zimbabwe has been through a lot. I’m totally baffled, still, when I remember the various stages leading up to Zimbabwe being forced to adopt the US dollar (or the ZUSA as Zimbabweans call it) as its official currency. It’s a journey that I’m sure many of you are all too familiar with. I remember the Zimbabwe dollar while I was at junior school… it was stronger than the British pound and $2 pocket money could buy you a slice of cake at the Friday cake sale, a drink, chips and an ice cream, maybe even with a bit to spare. We even used to have coins back then. My, what a different time that was. Zimbabwe was living large. This started to change in my last year at junior school, when Britain reneged on its obligations to fund land reform in Zimbabwe. Whether Britain acted fairly or not is debatable, but was is certain is that this juncture marked the start of the wrecking of the Zimbabwe dollar. Things were still sort of ok in my first years of high school. I mean, you could buy individual jelly babies at the tuck shop, which is always awesome. And because they were sold individually, it meant that everyone fought over the black jelly babies, which were by far the best. Looking back though, I realise two things about this jelly baby situation: 1. The jelly babies were far harder than they are anywhere else in the world. It was because they were stale, although we didn’t realise it then. 2. The people who ran the tuck shop clearly didn’t care about the general lack of hygiene involved in allowing people to pick which particular jelly babies they wanted. Never mind, they still tasted great. During O level history, we studied hyperinflation in the Weimar Republic after World War I. Although things were already tricky in Zimbabwe, we couldn’t conceive of having to carry money in a wheelbarrow, or having to pay for a meal in a restaurant as you ordered it, otherwise the price would triple (or more) in the time it took for you to eat your meal. Workers had to spend their entire salary in one day or else it would be useless the next. That’s if they were lucky enough to have a job and to earn a salary. That was totally WTF-like to us. We probably found it funny. By the end of high school, we were beginning to see just how devastating inflation, and later, hyperinflation, really was. It wasn’t funny. People’s life savings disappeared overnight and our parents were forced to spend their entire salaries almost immediately upon receiving it. We started using anything other than Zimbabwe dollars. We adopted fuel coupons as our unofficial currency, with a 1 litre = US$1 rate. Salaries were paid in fuel coupons and school fees were paid in fuel coupons. Groceries, too, were bought with fuel coupons and if you were owed change under 1 litre (US$1), you would be given an IOU slip. IOU slips then also became a form of currency… it was total madness. Even though no one was actually using the Zimbabwe dollar officially, hyperinflation continued to soar. The government responded by printing more money… they printed new denominations on already printed notes, which hadn’t been released yet as they’d only just come off the printing press. I remember the green $300 000 000 000 000 (three hundred trillion) being printed over the pink $50 000 on notes. That’s when I knew that things had got way out of hand. Come 2009, hyperinflation was in the trillions (or was it quadrillions?) of percent and money lost its value in mere hours. The Zimbabwe dollar had to be abandoned, fuel coupons put aside, and the US dollar adopted. It happened unofficially many months before the United States finally conceded and allowed their currency to become the official currency of another country, which is probably not a decision they’d had to make before. Once it was official, it was no longer against the law to use US dollars, and it was therefore no longer necessary to change money with shady dealers in dark passage ways. It made life in Zimbabwe easier, and now there’s an estimated US$2.5 billion in circulation in Zimbabwe. 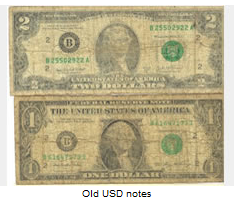 It’s just as well that Zimbabwean children aren’t made to learn who is who on ZUSA notes, because the notes are so worn and defaced that George Washington and Thomas Jefferson look the same. Confirm? As an aside, these old, dirty ZUSA notes are furry. Furry like the algae on the bottom of a pond… you know the furriness that makes your skin crawl because you know it shouldn’t be there. ZUSA notes are furry because they are washed… literally washed… to clean them so that their denomination can be identified and so that tetanus shots aren’t necessary. The notes get cleaned and then hung up to dry on washing lines. Zimbabweans call it “money laundering”… which just kills me! It’s so ridiculous! Zimbabweans are not ok.
Well, hopefully an exchange of notes will cut down on money laundering in Zimbabwe. And furriness.